Jet or Submersible Pump for Cool Cell Systems? We spoke with Hog Slat engineers, Tyler Marion and Tim King about the differences between using a jet or submersible pump to fill evaporative cooling systems. Here’s a quick synopsis of our discussion. 1) Jet pumps are more reliable because they can run dry for a period of time. For instance, if you discover during morning chores a leak occurring overnight had drained the system, a jet pump would still be working. A submersible pump that runs that long without water will need to be replaced. 2) Jet pump repairs are less costly. The impeller and motor are two individual components; a bad motor can be replaced separately. 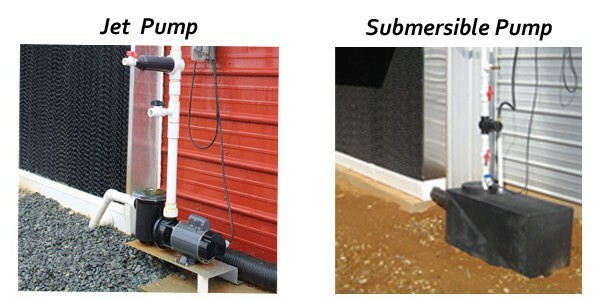 Submersible pumps are a single unit. 3) Jet pump repairs and service are easier. A jet pump system is all above ground…a submersible pump must be pulled from the sump for repairs. A drain plug on the GrowerSELECT jet pump allows easy access for service and winterizing. 4) The integrated trash basket on a jet pump protects the pump from debris. 5) Submersible pumps are designed to move waste water from underground applications; low volumes with high head pressures. Jet pumps are a better choice for evaporative cooling applications as they move larger volumes of water at reduced head pressures.